We are proud to be the first clinic in Guernsey to offer this cutting edge treatment which enhances healing of your joints and tendons through the power of your own cells. PRP is a concentration of platelets in a small volume of plasma that is prepared by centrifugation of your blood. Platelets were initially known to be responsible for blood clotting, however they are also a potent source of growth factors and other bioactive proteins that enhance the natural healing and growth processes. PRP is an emerging treatment in a new health sector known as “orthobiologics”: the philosophy of which is to merge cutting edge technology with the body’s ability to heal itself. When injected under ultrasound guidance the concentrated platelets release huge reservoirs of bioactive proteins, including growth factors that help to initiate and accelerate tissue repair and regeneration. PRP therefore initiates the biological processes necessary for the repair of damaged or worn tissue, such as tendons, ligaments, cartilage and muscle. A recent systematic review of all the research literature has confirmed the benefit of PRP in alleviating pain in osteoarthritis of the knee. It can be used to treat all other osteoarthritic joints such as the ankle, thumb, big toe and hip. PRP is increasingly being used to treat tennis or golfer’s elbow as well as many other tendinopathies. It can be used as an alternative to a steroid injection, which in tennis elbow has been shown to cause increased pain 6 months after treatment (worse than a placebo injection!). PRP can also be used to treat partial tendon, ligament or muscle tears. It can be used to treat both acute and chronic injuries and may be recommended where conservative rehabilitation has failed. The main benefit of PRP is that it uses the bodies’ own natural healing properties to alleviate a pain or problem in the musculoskeletal system. Unlike steroid injections there are no limits on the number of injections you can have. There are no drugs involved in a PRP injection, so there are no reported side effects making it a very safe injection. 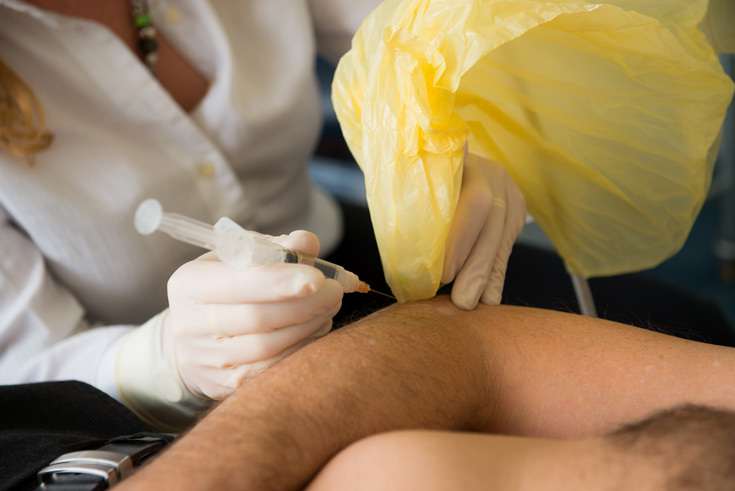 There is a small risk of bleeding and bruising or infection at the injection site but this is exactly the same risk whenever a needle is used to pierce the skin (approximately 1 in 1,000). This may be increased in diabetic or people on blood thinning drugs. If you are taking a non-steroidal anti-inflammatory drug, these should be stopped 48 hours prior to the injection. Drink 1 to 2 litres of water before your clinic appointment. This will make is easier to obtain a good blood sample. When you are well hydrated, the cells are in the correct ratio to water and the quality of the PRP is better. The blood sample will be taken from your arm by the doctor or a nurse and then spun in a centrifuge for 9 minutes. This will separate the red cells from the plasma and the platelets. The PRP is then ready to be injected into the affected area, which will be numbed by an injection of a local anaesthetic first. Ultrasound will be used to guide the injection to the appropriate place as this help to improve the accuracy and decrease the pain of the injection. It is not recommended that you drive immediately after the injection. There may be a little discomfort for the first 48 hours after the injection. Paracetamol may be used to control pain. Avoid taking Non-steroidal anti-inflammatory drugs for 10 days after the injection. After 1 week you can resume gentle exercise and will probably be recommended to see a physiotherapist for a rehabilitation programme. This will depend on the condition treated. For osteoarthritis 3 injections at weekly intervals are recommended to give the best results but for a tendinopathy or tendon tear, one injection may be enough.